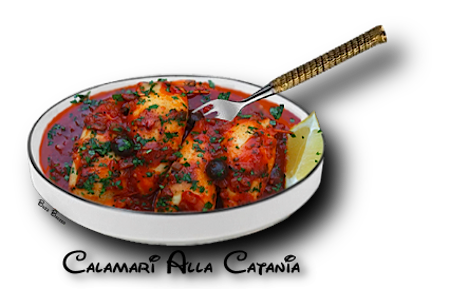 Calamari tubes stuffed with herbs, sun-dried tomatoes sauteéd in a tomato sauce. Catania is on the East Coast of Sicily and is known as the "City Of Lace". Lace making is the primary industry of Catania. It is a Port O' Call for cruise ships and is a bustling city noted for Sicilian cooking at it's best. 1. Preheat oven to 350°F. insides of the tubes and wash out thourohly. cook until opaque ( no longer than 2 minutes). 4. Add peas, garlic,  anchovies,  sun-dried tomatoes, and basil and stir through, about 1 minute. 5. Add bread crumbs and stir to coat. 6. Season with salt and pepper and add parsley. Allow mixture to cool. dish (just large enough to hold calamari and sauce). 8. Add wine,  olives and tomato sauce and stir to settle. 9. Place in oven and bake 35 minutes.